Columbia River Decoys proudly presents a "Premier Collection" of waterfowl decoys from the original woodcarvings of Northwest carver Donald Guthrie. Donald and Mario learned to carve under Don Baiar of Vancouver Washington, who Donald describes as "a master woodcarver in the mold of some of the great American waterfowl carvers who came from the Astoria, Oregon area." Don carved with Baiar for a couple of years, initially to make some of his own birds because "there was no waterfowl decoy out there with the detail and realistic attitude I wanted." Mario just finished a new decoy which has about 200 hours into it. "I wanted to add a new species to our line and hopefully I did everyone proud." Don and Mario's master carvings have 180-200 hours put into to them and that is very apparent in the product today. Mario works for Zink Calls and Avian-X Decoys as a National Retail Specialist. He is also the Mossy Oak Regional Pro Staff Manager for the Pacific Flyway. He is a Delta Waterfowl member and has been a Ducks Unlimited volunteer since his dad got him started. He has served as an DU Area Chairman and District Chairman in Tualatin Oregon. He has served on the board and also as President of the Oregon Waterfowl Festival. He lives for being in a duck blind and tries to spend as many days in the field that he can. Mario has guided for Pacific Wings Waterfowl Adventures in Richland Washington for several years and attributes alot of his knowledge to owner and operator Mike Franklin. Mario now runs Columbia River Decoys Guide Service which is based out of Sherwood at the Amstad Duck Club. He also manages the main duck club on the farm as well. Each decoy is individually molded and hand painted, and are created for natural movement, incredible realism and durability. They are molded from a rigid foam and are designed with an inverted keel. This keel system produces movement on the calmest of days and also sets equally well in the marsh, tidewater, ice, and field. Each decoy in the collection displays a different attitude, (or head and body style), giving incoming birds the confidence to land in the realistic looking spread. 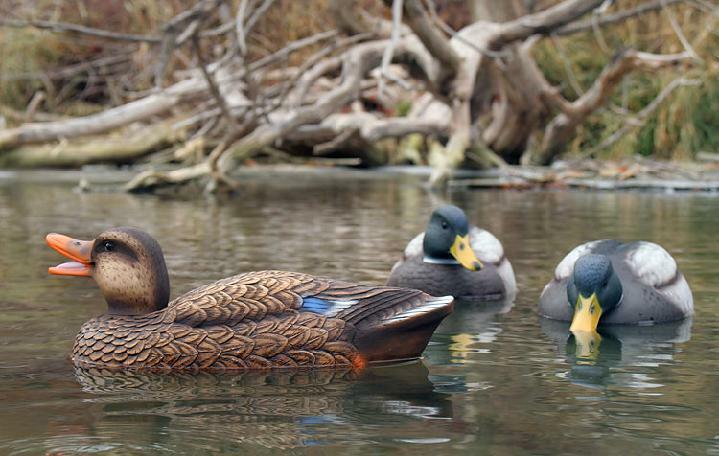 Decoys symbolize the heritage of waterfowling. They represent the most important communication between you and the birds in the sky. 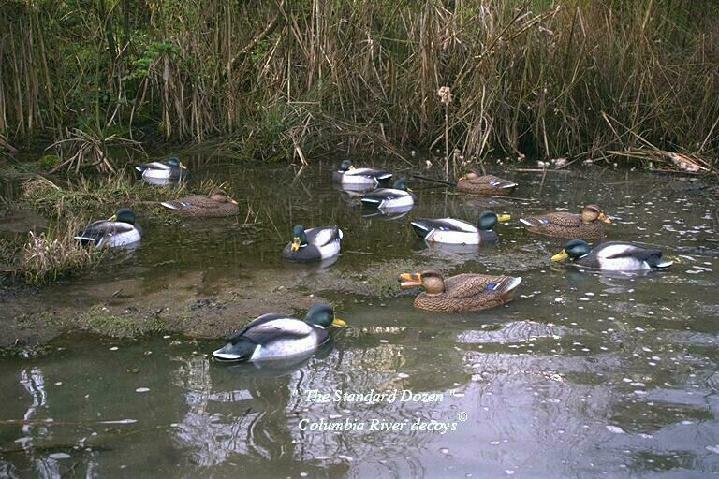 The advantages of Columbia River Decoys are shape, coloration, movement and attitude. Shape: Our lifelike carvings are second to none with each bird displaying a different attitude or head and body style. Each bird�s detail is carved down to the very last feather. Coloration: We researched for years and have exhausted a lot of money and time in finding the best paint for our decoys. We are confident in saying that we have the best paint adhesion, the most durability and unmatched paint colors of any decoy on the market today. Movement: With our inverted keel, you get movement on the calmest of days and also get a spread of decoys that is "alive" on every day in the field. Attitude: We have 9 different head positions on our birds which gives you a lifelike spread of decoys that looks as natural as a real flock of ducks. By The Time They Figure Out They're Decoys.........IT'S TOO LATE!! !